UK Release Date - 7th September 1987. UK Release Date - 14th September 1987 (7" Shaped Disc). US Release Date - 6th May 1988. Format - CD (Germany Only). Assisted/Engineered By - Nigel "See long player for details" Green. Remixed By - Robert John 'Mutt' Lange (Extended Version). Linda Walker, Susanne Catty, Mark Howell, Sarah Willis and the legendary Donna Elliott. Live Track 05 - Recorded 25th June 1987 in Tilburg, Holland. Special Formats - Limited Edition Triangle Shaped Picture Disc 7 Inch vinyl in 12 Inch Gatefold card sleeve. Special Formats - German 1987 CD Single, same sleeve as UK single. Only released on CD in Germany. Special Formats - German 1989 Double A-Side CD Single with 'Rocket', bottom right of Hysteria sleeve. The second UK single from 'Hysteria' was released in September 1987. 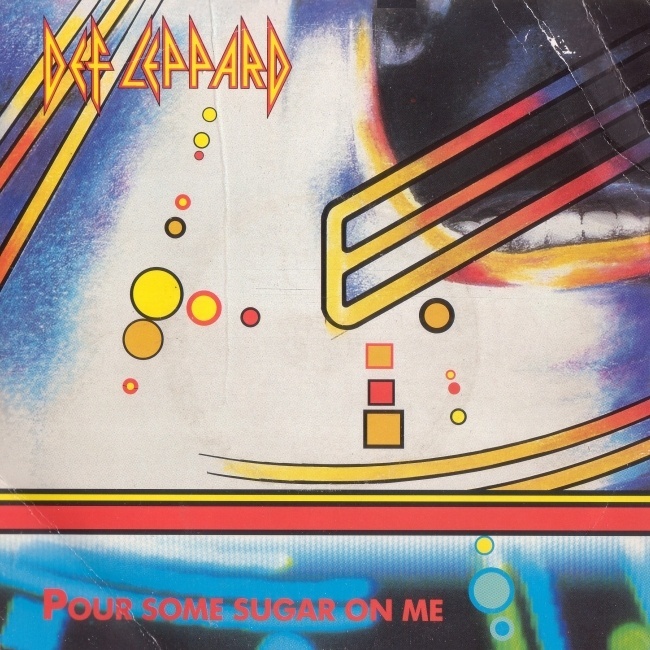 'Pour Some Sugar On Me' was the second hit in the UK reaching number 18. It became an even bigger hit in the US reaching number 2. Their highest charting US single so far and it resulted in almost four million more copies of the album being sold during mid 1988. It also pushed the album to Number One there a year after it's release. The single was later re-released with 'Rocket' in Germany. It became one of the most iconic and popular rock songs of the 80s. The single was issued with a special 7" shaped Leppard triangular logo picture disc in the UK - housed in a silver 12" sleeve with the 1987 tour dates inside. It was only issued as a CD single in Germany. Two different versions exist from the first (1987) and second (1989) releases. The second featured the Edit version - also found on the US 7", US 7" promo, the UK 'Rock Of Ages' documentary sampler CD and the four-track 1992 Def Leppard CD Sampler (DEFCD 1992). It has the first "Love Is Like A Bomb" line from the US Video version before going right into the normal song. Basically the album intro replaced with that one line, cutting the song down from 4:26 to 4:23. Another new track 'I Wanna Be Your Hero' was included on the UK release along with the Extended Version of PSSOM. Other UK B-Sides were used on various versions around the world from 1987 to 1989.